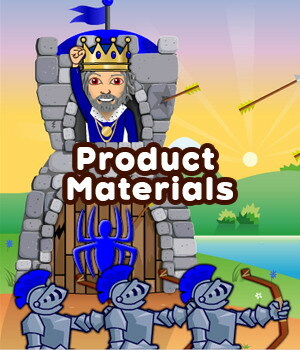 This lesson teaches English learners the raw materials different things are made of or made from, and where they are made. 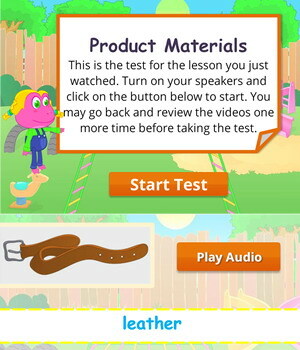 This English lesson for kids also focuses on vocabulary related to product materials such as plastic, leather, wood, gold diamond etc. 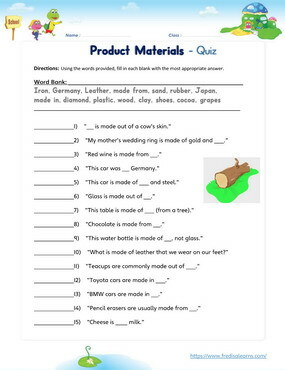 The communicative objective of the lesson is to enable English learners to ask and answer questions about different manufactured items. The grammar objective of the lesson is to teach children the subtle differences between made of, made from, made out of and made in, which are used in the passive voice. Another grammar objective is to introduce the use of tag questions, used when asking for confirmation. The worksheets below are useful for offline and classroom activities. 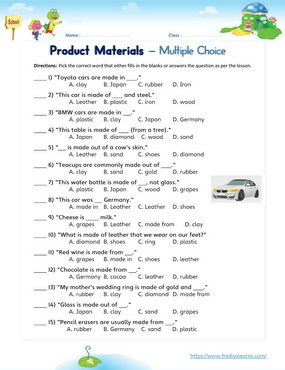 These printable exercises directly correlate with the above lesson 'Product Materials'. Every worksheet comes with an answer sheet on the second page for educators. Freddie, Lisa and Mom are at a shopping mall. 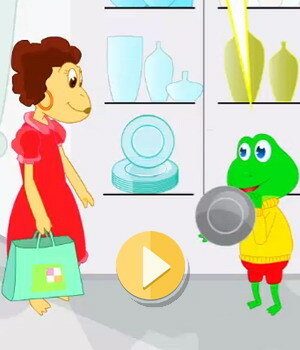 Curiosity gets the better of the kids as they try to learn what different items in the shop are made of. Mom gets to answer many questions from the kids, which helps them learn. Made of: We use ‘made of’ when the basic or raw material is still very evident in the final product. What is this belt made of? It is made of leather. Made from: We use ‘made from’ when the connection between the raw material and the final product is not so evident. Think of it as the opposite of ‘made of’. Made out of: We use ‘made out of’ when referring to the main or specific material used in making a product. Glass is made out of sand. Made in: We use ‘made in’ when asking about the place a product was made. Where are BMW cars made? Where are your pencils made? When the sentence is in the negative, the ending tag question is in the affirmative. When the sentence is in the affirmative, the ending tag question is in the negative. This isn’t a Toyota car, is it? This is made of glass, isn’t it?